"You Put de Glitter in the Polish, and You Mix 'Em Bot' Up!" Spicing up mani & pedis with décor is an art, and requires skillful technicians. Offering this talent to your clients is a great way to set your salon apart. With so many nail product lines going bolder, brighter and more creative than ever before, it's what’s in demand, and it is essential to adhere to the times in order to drive new and repeat revenue. 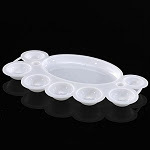 Pure Spa Direct recently added the Color Mixing Tray, which I just think is such a neat nail tool! Say good-bye to complicated layering and hello to pre-mixing. Especially for the Nail Harmony Gelish lovers out there! Since there is such a variety of Gelish colors and glitter polishes in the line, why not be creative and do some experimenting by mixing the polishes you already have to multiple the colors you can offer. Use this crafty Color Mixing Tray as a painting pallet to pre-mix colors before application and VIOLA!- a new color combination with dimension, that’s consistent throughout! 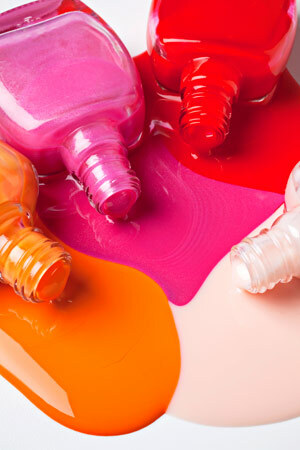 …and yes it's true, you may pre-mix Gelish colors prior to application! One of my favorite uses of the Color Mixing Tray is for the glitter polishes! Some Gelish polishes have glitter, others do not... now they all can if you'd like! Add bigger chunks of glitter to polishes that have smaller ones, and add them both to polishes that don't have any glitter at all....."And then mix 'em all around!"…. Purchase the Color Mixing Tray for only $2.45, to create new nail creations and to take your salon to new places it’s never gone before! Light Elegant & June Bride! June Bride & Tutti Frutti! Night Shimmer, Water Field, & Vegas Nights!